Epson's PictureMate 240 looks similar to the type of kid's bucket you take on the beach to make sandcastles. It comes complete with a carry handle, so the impression given is of a rugged device that you can use to print 6 x 4-inch postcards while you're on holiday. Presumably, this was Epson's plan as there's a cover on the back of the printer for an optional battery. This was not supplied to us and we cannot find it on sale in the UK, although the Americans have it for $50. There's another tantalising option in the shape of an optional £25 (inc. VAT) Bluetooth adapter that plugs into the USB PictBridge port, but neither was supplied along with our review sample. Direct printing from a memory card works well enough and superb photos rattle out in 52 seconds per print, which is more than acceptable. Sadly, there aren't any software options, such as the ability to fix red-eye, which does limit its appeal. You'll do better to install the CD of Epson utilities on your laptop, as this offers you all of the tools you need to work with your photos. It's a minor complaint, but when you use the Fix All tool in the Easy Photo Print utility you don't get a before and after preview to show the results of your changes, so you have to trust your own judgement. However, from our test samples, the photos came out well. Printing from a laptop allows you to enable Enhance Fine Detail, which is the highest quality setting. 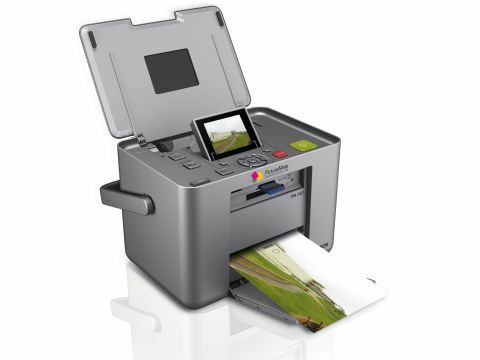 Epson sells a PicturePack at £29 (inc. VAT), which includes a photo cartridge and 135 sheets of glossy photo paper. This works out at 22p per print, which is more than acceptable. It's not perfect, the PM240 looks and feels a bit cheap and cheerful with rubber buttons and a tendency for finished prints to fall off the output shelf. On the other hand, the price is low and the print quality is very good indeed.